San Francisco Mayor Visits "The O'Reilly Factor"
San Francisco Mayor Gavin Newsom did an admirable job of not embarrassing San Francisco on The O'Reilly Factor last night. If San Francisco Mayor Gavin Newsom's appearance as a pundit on The O'Reilly Factor is any indication, he's still looking to convince the state and nation that he isn't just that gay marriage guy. 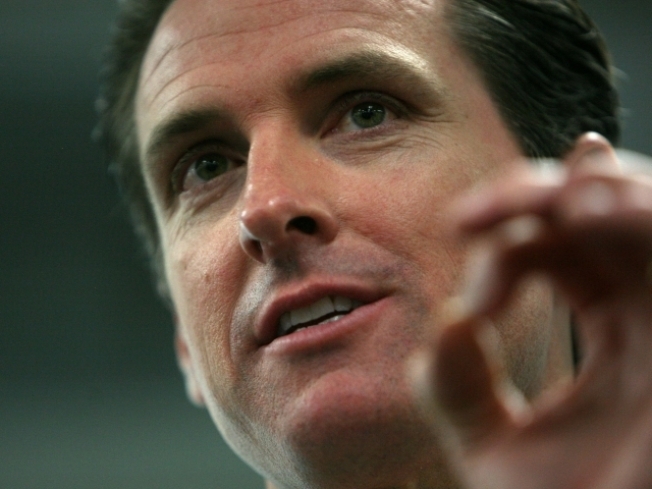 Newsom tweeted of the appearance, "Defended SF's progressive and fiscally sound policies on O'Reilly tonite." Newsom quickly said that he was an avid viewer of Bill O'Reilly's show, suggesting that either he or O'Reilly was getting more moderate -- O'Reilly assured him that it was the latter. O'Reilly then went on to call Newsom a "progressive," when among San Francisco progressives he's generally regarding as standing somewhere to the right of Mussolini. But Newsom didn't disabuse O'Reilly of this notion. Newsom did correct O'Reilly, who tried to belabor his own point that liberals can't govern, that San Francisco's budget deficit is not $6.6 billion. That's actually the city's entire budget, with a projected deficit of around $512 million for the next fiscal year. In touchier-feelier Newsom news, apparently he spends his Saturdays calling the homes of truants in order to urge them to go back to school -- and often gets an earful in response. Funny, if he'd been willing to make such awkward calls to potential donors, he would probably have raised far more than Attorney General Jerry Brown toward his abandoned gubernatorial campaign. Jackson West agrees with Newsom that his approach to city finances is fiscally conservative.